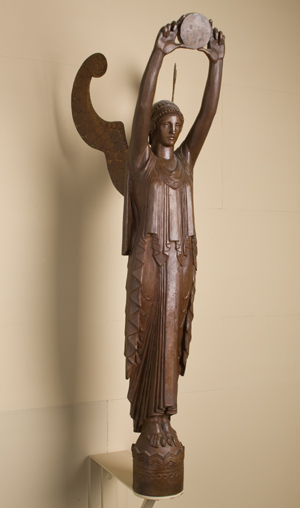 This piece is one of many sculptural elements created by Lee Lawrie for the National Academy of Sciences Building on Constitution Avenue in Washington, D.C. Lawrie (1877 - 1963) has been called the dean of American architectural sculptors. Over the course of his career, Lawrie collaborated with NAS Architect Bertram Grosvenor Goodhue on many projects. They believed that sculpture should be integral to the architecture of a building and not merely applied as decoration. This figure, and its twin, decorated a carved mahagony rostrum used for meetings and ceremonial occasions in the Great Hall. Lawrie's sculptures in the NAS building include architectural elements such as columns as well as animal, botanical, and figural depictions.